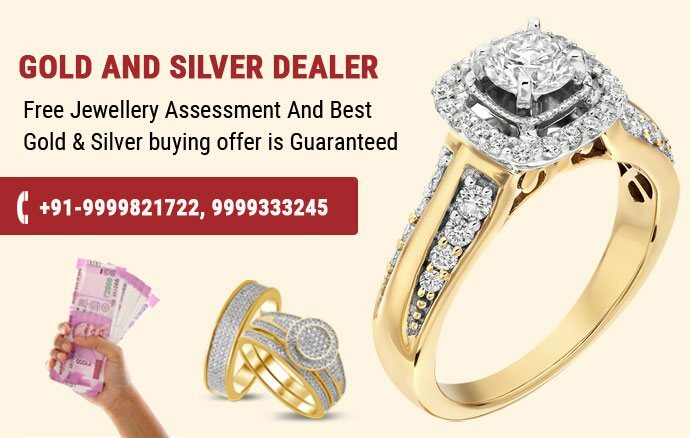 Our establishment, Gold & Silver Dealer is counted as one of the leading jewellery buyers in Delhi NCR and is the first choice for the customers trading ornaments for cash. We buy all kinds of precious jewellery items that are created using Gold, Silver, Diamond, Platinum and Gemstones. The valuable ornaments may be present in any form such as Chain, Bracelet, Earring, Ring, Pendant, Anklet, Coin and Necklace. Further, customers visit our outlet to sell gold jewellery for cash in Delhi because we are offering the highest payment in Delhi NCR zone. Some of the jewellery items that we purchase are Bangles, Rings, Coins, Chains, Earrings, Anklets, Necklaces and Pendants no matter whether its broken or old just visit our outlet will purchase it. Trade Cash for Gold Faridabad, Ghaziabad, Vaishali, Karol Bagh, Rajouri Garden, Kirti Nagar, Mehrauli, Sukhdev Vihar, Gurgaon. Customers have appreciated our cash for Gold services because gold estimation is done by making use of globally recognized techniques therefore accurate. Further, an instant transfer is made to the customer for gold selling and the complete transaction is done in a safe private office. Sell broken & old gold jewellery in Vasant Kunj, Malviya Nagar, Sarojini Nagar, Greater Kailash, Naraina, Rajinder Nagar, Netaji Subhash Place, Nehru Place, Badarpur – Immediate payment transfer no waiting time.The Gold items that we purchase include Rings, Bars, Earrings, Bracelets, Coins, Bangles, Anklets, Utensils, Chains just visit our outlet with the jewellery and we will purchase it. In recent years, Gold & Silver Dealer has emerged as the most-liked destination for selling silver items in Delhi NCR. We are the largest buyer of second hand jewellery which includes silver ornaments also. Further, silver assessment is done by our genius team and the Cash for Silver price is given to the customer. The location of our outlets offering cash for silver in Delhi Tilak Nagar, Patel Nagar, Punjabi Bagh, Munirka, Chanakya Puri, Rajendra Place, Sultanpur, Tughlakabad. The silver ornaments that we buy includes Tea Sets, Kitchen Utensils, Rings, Pendants, Chains, Coins, Bangles, Anklets and Bars. Visit our outlet Gold & Silver Dealer for selling any type of diamond be it a Wedding ring, Pendant, Necklace or Anklets. We make instant money transfer to the customer on purchasing a diamond or can pay cash as per the request. Further, having multiple branches in Delhi NCR makes cash for diamond outlet easy to reach. You can find our shops for Cash for Diamonds Noida, Delhi, Ashram, Moti Bagh, Dhaula Kuan, Rajouri Garden, Naroji Nagar, Kamla Nagar, Civil Lines, Mukherjee Nagar, Azadpur, Shalimar Bagh. We are doing the Diamond assessment based on parameters like Color, Cut, Carat Weight, Clarity and are buying all types of precious stones including Solitaire Diamond. One of our other premier services includes cash for gold coins which is mostly availed by the individuals. Actually, gold coins are very common in Indian houses and can get you the very big amount on selling to us. Furthermore, payment can be made anywhere in the world and above all, we verify gold coin on varied variables and give our buying price.Our locations for Cash for Gold Coins Delhi, Dwarka, Sadar Bazar, Chandni Chowk, Darya Ganj, Pahar Ganj, R K Ashram, Pusa Road, IFFCO Chowk, Sikanderpur, YMCA, M.G.ROAD, Mohan Nagar, Greater Noida. We buy gold coins of any size, weight and purity, just visit our any shop we will give you the price and purchase it immediately. A nice feedback from the customer availing to sell unwanted jewellery for cash services pushes us to focus more on doing extra efforts and make jewellery selling a pleasant experience. Further, getting to hear a positive feedback gives us a satisfying experience and a feeling of joy. I was wondering where to sell my jewellery for cash in Delhi NCR and had given up on it. But I found your company advertisement and visited to sell my silver ring and got an incredible price which was way above my expectations. Thank you. Was going through a very bad financial condition and left every hope in life. Then I came across your outlet in Noida and decided to visit it for selling my gold chain and you gave the top price. Above all, you gave me 4% extra on the final amount. Never thought jewellery selling can be an amazing experience at your outlet. I was not getting the right price for my diamond ring and had visited numerous shops. My friend told me about your outlet and you gave the price I was looking for. You guys deserve full five points. I sold my gold coin here for an attractive price and evaluation method was concluded quickly. Everything went right for me as the deal offer was fair and you gave me money immediately.